Have you been to Bill’s before? I remember hearing about Bill’s about four years ago when they only had a handful of restaurants in London. Since then Bill’s has expanded drastically and I was so excited when they opened a new branch in my home town, Maidstone, Kent. We began the evening with cocktails from their latest summer cocktail menu which start from a reasonable £4.50. Bill’s has an extensive drinks menu including their own labelled house wine (red, white and rose), beer and cider. On arrival at Bill’s as well as being handed a drinks and food menu, they also offer a produce menu. The menu reveals a treasure trove of treats available to buy, from coffee flavoured chocolates to chutneys. There are pencils on the table so you can tick off what you want to order before handing the menu back to your host. It’s an utterly charming and creative idea, which makes it different to just any other restaurant popping up in the county town. Every Bill’s Restaurant has a quirky design with distressed timber features and shelves piled with retro looking cans, it has a shabby chic look and I like it. It’s lively and vibrant with dim lighting for that relaxed feel. It’s a great ‘date night’ location but also perfect for a catch up with friends over brunch. For a Wednesday night the restaurant was very busy, which I was surprised about as with other restaurants in Maidstone I find them pretty quiet mid week. 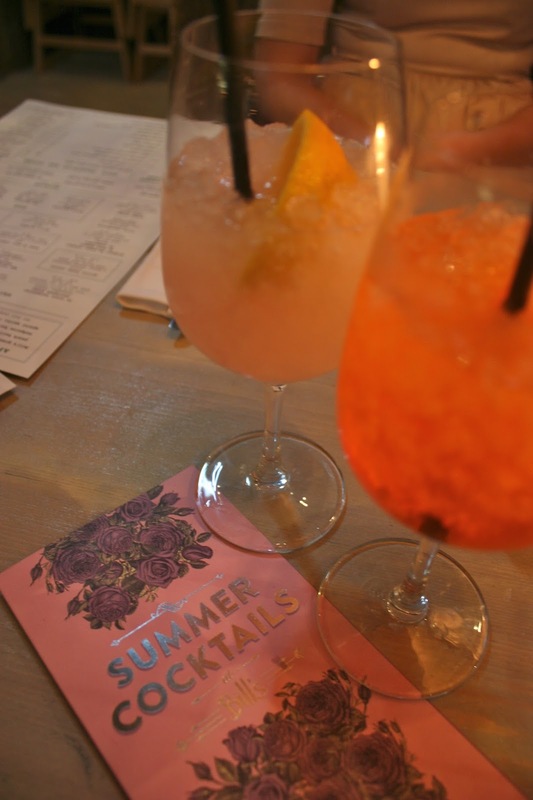 We sat back and soaked up the relaxing atmosphere with an Aperol Spritz and Hedgerow Fizz and took a look at the A La Carte menu. The halloumi was tasty and a very generous sized portion, it came served with my favourite sauce – garlic mayo. The halloumi paired well with the garlic mayo which was full of flavour without being too overpowering. The main menu is varied and caters for even the pickiest for eaters! We were also told that the menu changes monthly which just means I’ll have to make trips there more regular. I managed to get my chorizo fix with the Bill’s Chicken and Chorizo served in a bun with delicious avocado mayo and skin on fries on the side (£10.50). The burger was tangy and fresh and not dry at all, which I often find with chicken burgers, I was not disappointed. By now I was so full but I persevered. I couldn’t leave without trying dessert. 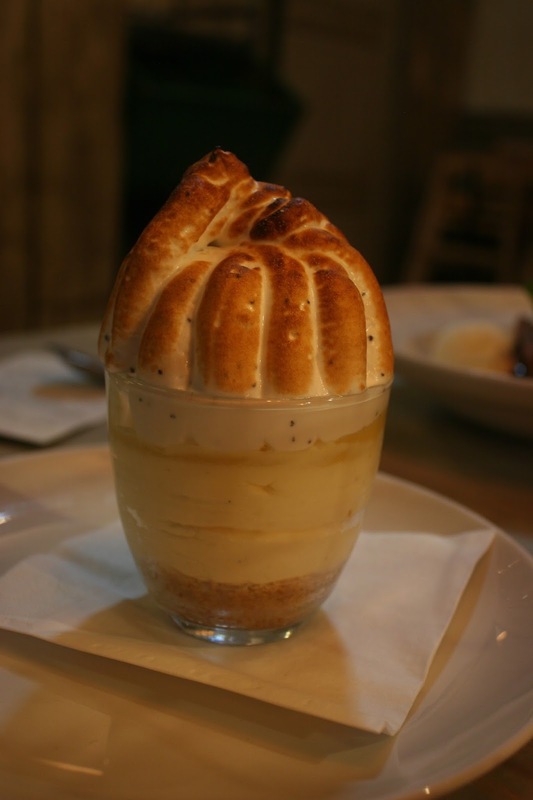 Karl tried the Lemon Meringue Pie Cheesecake in a glass (£5.50). A gorgeous stack of Bill’s Lemon Curd, Yoghurt Ice Cream and Poppy Seed Meringue. It was a struggle but it was too nice to leave any behind! I went Warm Chocolate Brownie with Chocolate Sauce, Vanilla Ice Cream and Chocolate Flake (£5.95). Our waitress highly recommended the Mini Cinnamon Doughnuts so I returned a few days later to try this. They were also very delicious but the chocolate brownie is always a winner for me being a chocoholic. The service was absolutely flawless, we felt comfortable and very well looked after. After having such a wonderful evening I returned again to enjoy their set 2 course menu for £9.95 which is served between 12-7pm Monday to Friday. I can see why Bill’s is expanding fast. I’ll definitely be back to sample their afternoon tea which can be purchased for under a tenner, I didn’t think a deal like that even existed! For more locations check out their website.